 Everyone will gobble up these crudités (photo Pinterest). 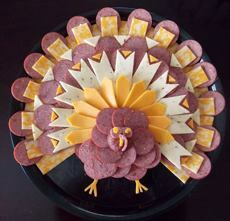 More elaborate: cold cuts—here summer sausage with different cheeses—do the Turkey Trot*. With Thanksgiving a week away, you have license to lay out any Thanksgiving-styled food right now. Don’t wait for the Big Day, because the day after that it’s…the Christmas rush. We found these photos on Pinterest, and regret that we couldn’t find the original sources (if it’s you, let us know). 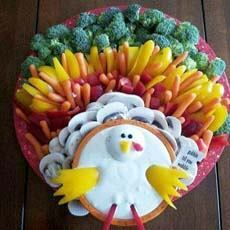 Just head to Pinterest.com and search for “turkey vegetable platter” and you’ll be dazzled by dozens of options. Thanks to the creative cooks who designed them, the crudités plates are very, very easy. Just buy the ingredients and lay them out the same way. Crudités (croo-dih-TAY) is the French term for a traditional appetizer, a platter of raw vegetables usually served with a vinaigrette or other dipping sauce. It can include asparagus, bell peppers, broccoli, carrots, cauliflower, celery, cucumber, fennel, radishes, and anything else that appeals. In the U.S., hummus has become a popular accompaniment. The crudité plate is a relative of the American relish tray, a “delicacy” served from the 1700s and still popular up to the 1970s. According to Salon.com, it was once considered the most special part of the meal, and a must-have at Thanksgiving dinner. Our Nana’s relish tray offered carrot and celery sticks, radishes carved into flowers, black and green olives (the latter pimento-stuffed) and sweet gherkins. She served it in an oblong cut-crystal dish. We loved it! The original Turkey Trot was an dance created in the early 1900s, danced to fast ragtime music—usually by those young enough to keep up. Watch this video, with a contemporary dance teacher breaking down the steps so you can follow (fast forward past the inaudible opening comments). The Turkey Trot was denounced by the Vatican for “offensively suggestive” positions. Conservative adults tried to get it banned at public functions for promoting “immorality.” Dancers were fined for disorderly conduct. All of this only served to increase the dance’s popularity. But by 1914, the fad was over. The foxtrot, a conservative dance based on the waltz, ascended. Here’s more on the Turkey Trot. WANT TO TURKEY TROT ON THANKSGIVING? Watch the video and put on some ragtime music. You’ll wonder what the Vatican was so concerned about (well, there is one brief moment of booty-flaunting). And, a round of Turkey Trot can distract from the anticipation of waiting for the food to be ready.